HONG KONG—The Independent Commission Against Corruption (ICAC) has withdrawn its request to the High Court that iSun Affairs Weekly hand over the videos and notes from an interview in which a former supporter of the Hong Kong chief executive sought to settle scores with him. On Oct. 7 the Court dismissed the ICAC’s lawyers request to postpone the case and ordered ICAC to pay for the court costs. iSun Affairs executive editor Zhang Meng welcomed the court’s ruling, saying it is good news for all Hong Kong media and the freedom of the press. The interview, published in January, was with Lew Mon-hung, ex-delegate of the Chinese People’s Political Consultative Conference and successful stock broker and oil executive. In it, Lew Mon-hung claimed Chief Executive Leung Chun-ying, popularly known in Hong Kong as C.Y. Leung, had gained favor by siding with the faction of former Chinese Communist Party head Jiang Zemin and associating with the Hong Kong triads. Leung was then chosen for the chief executive position by Zeng Qinghong, a Jiang faction powerbroker who used to hold the portfolio for Hong Kong and Macau, according to Lew. Ironically, as a volunteer for Leung’s campaign, Lew is credited with doing significant damage to rival Henry Tang’s campaign by standing outside his home giving out fliers calling attention to the illegal structures Tang had added to his home. Animosity between Lew and Leung dates back to Lew’s work on the campaign. According to the online HK Magazine, Leung never asked Lew for help with the campaign, but accepted his help when offered. In the interview with iSun Affairs Lew claimed Leung had promised to appoint him to Hong Kong’s executive council if he won the election, but then refused to do so. A deal was then brokered according to which Leung would recommend Lew retain his post as deputy to the Chinese People’s Political Consultative Conference (CPPCC), Lew said, but the deal fell through. 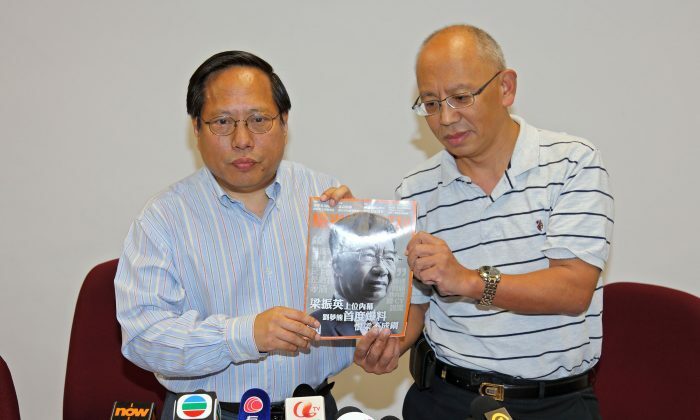 Lew Mung-hong’s interview with iSun Affairs was published in January. Then, the ICAC showed up, arresting Lew in February for having bribed the deputy consul-general of Kazakhstan in an oil deal. Lew responded by sending letters to C.Y. Leung, asking him to stop the ICAC investigation. In August, the ICAC charged Lew with the intention to pervert the course of justice in connection with emails he sent to Leung and the head of the ICAC, in which Lew demanded the investigation of him cease. The ICAC’s move against iSun Affairs began on Aug. 7 with an application to the High Court on August 7 demanding that iSun Affairs surrender videos and written notes from the interview. In the Oct. 7 hearing, Judge Thomas Au asked ICAC why they wanted all those files since they could just investigate the contents of the report if they wished. ICAC explained that it was to ensure the accuracy of data. Judge Au pointed out that iSun Affairs had fulfilled the responsibility of the press by directly quoting Lew Mon-hung. ICAC requested an adjournment after consulting the Department of Justice, but was refused by the judge. ICAC then withdrew their application, and the Court ordered them to pay the court costs for both sides. “iSun Affairs has been very firm about the principle that the entire industry must keep the confidentiality of its information sources. They have been very brave defenders of this principle,” Ho said. Ho said that some people might try to use this case to set a precedent so as to solicit information from the media in lieu of obtaining a search warrant. He said the police might use the press as a tool for gathering evidence, which would prevent the media from conducting sensitive interviews. The Hong Kong Journalists Association in a statement agreed that this court ruling protects press freedom. They said reporters have a responsibility to ensure that data will not be leaked. Otherwise, the public will no longer trust journalists and sources of news will be silenced. However, the Journalists Association also worried that others will follow ICAC’s lead. The Association urged law enforcement agencies to avoid using similar approaches to extract news information and to review their investigative practices in order to protect the freedom of the press. The dangers posed to press freedom by this affair may involve more than protecting sources. On June 3, iSun Affairs founder Chen Ping was attacked by two masked men with batons near his publishing office and was sent to a hospital for treatment.